Stanford Advanced Materials provides high quality Nickel Aluminum wire with excellent surface, stability, and mechanical properties. 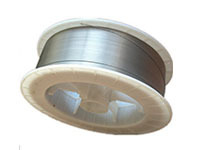 Related products: Aluminum Magnesium Alloy Wire, Tin Zinc Alloy Wire, etc. SAM's nickel aluminum alloy is one of high nickel alloys which are commonly used in electronics, synthetic fibers and battery applications. Nickel-Aluminum-base materials are suitable for electric arc spraying technology. Their coatings are compact and have high temperature oxidation resistance, heat resistance and scratch resistance, and the bonding strength is above 55MPa. The coatings can also be used directly as a working layer.